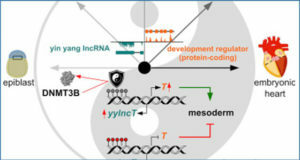 Long non-coding RNAs (LncRNAs) have been identified to play important roles in epigenetic processes that underpin organogenesis. However, the role of LncRNAs in the regulation of transition from fetal to adult life of human heart has not been evaluated. Researchers at Wenzhou Medical University used immunofiuorescent staining to determine the extent of cardiac cell proliferation. 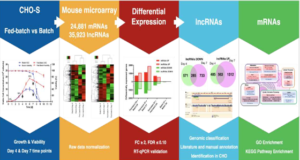 Human LncRNA microarrays were applied to define gene expression signatures of the fetal (13-17 weeks of gestation, n = 4) and adult hearts (30-40 years old, n = 4). Pathway analysis was performed to predict the function of differentially expressed mRNAs (DEM). 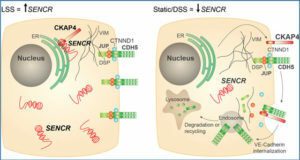 DEM related to cell proliferation were selected to construct a lncRNA-mRNA co-expression network. 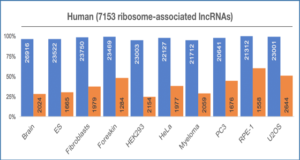 Eight lncRNAs were confirmed by quantificational real-time polymerase chain reaction (n = 6). Cardiac cell proliferation was significant in the fetal heart. 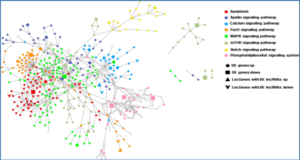 Two thousand six hundred six lncRNAs and 3079 mRNAs were found to be differentially expressed. 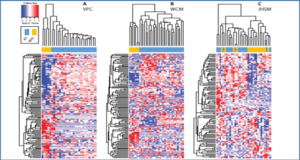 Cell cycle was the most enriched pathway in down-regulated genes in the adult heart. Eight lncRNAs (RP11-119 F7.5, AX747860, HBBP1, LINC00304, TPTE2P6, AC034193.5, XLOC_006934 and AL833346) were predicted to play a central role in cardiac cell proliferation.